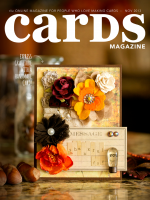 Crafty Girl Designs: All Things Adorable! Hello everyone! And a happy Saturday to you! I hope that it's Spring where you are as it snowed here last night and we are covered in snow! I worked last night, and I hardly work but it seems that when I do I often have crazy weather afterward! All the more to test my driving! 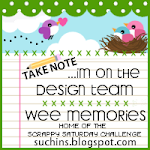 :> I am here with another fantastic Wee Memories Scrappy Saturday Challenge! 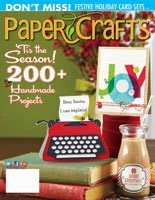 This week we have a terrific sponsor, with the cutest stamps, Your Next Stamp! I feel a certain closeness to them as they are Canadian like me! 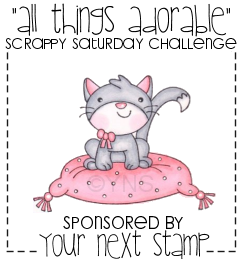 Our challenge is super fun: All things adorable!!! I was soooooo excited to play with this mermaid stamp! Beyond! As you know my daughter is named Ariel, not that we named her after the little mermaid we just loved the name! But she loves mermaids which makes me too! I made up a mini card set, 4 by 4. I love that I am now prepared for the next 4 girl birthday parties that come up! I loved playing with this mermaid I had to make 4!!! I colored each mermaid with my pencils but her tail is paper pieced. I added stickles to her tail and a rhinestone to the flower in her hair! I made waves with 3 shades of bazzill cardstock (my fav shade of blues) and a scallop punch, added some clouds cut from my PTI die, and a birthday sentiment by HA, and finished it with twine that matched the girls tails! This was so fun to make! I really hope you will join us this week and play!!! The Top Hoot will win a stamp set for YNS! And Jenny has started to draw for a random prize from everyone who plays (and follows the rules!) Please make sure to stop by the Wee Memories blog to see the rest of the lovely DT's work! Oh my, this is a super cute set, Anita! Love them! This set is gorgeous Anita, I bet your daughter loves them! These are sweet as could be! I love them! Oh my... what a cutie patootie set! This is just so adorable! what an adorable set Anita.... Ariel and her friends will love them. Off to see what everyone else has come up with. Totally gorgeous set of cards Anita! Love that stamp and I adore your scalloped waves! So cute Anita! Love the different colored hair and the paper piecing! These are so cute, Anita! We had very strange weather in Toronto today. It started off sunny, then we had a sudden snow squall which turned to hail and then rain! :O I hope your snow melts and you can enjoy some warmer weather. This is sweet indeed, love this set you made, Anita!! That mermaid is darling! I'm such a sucker for cute images like that! Anita you did a fabulous job with these! Super adorable! Gorgeous, gorgeous, gorgeous, Anita! You are the QUEEN of card sets! Your cards are adorable. I love those images and also how you created the sea out of border punches. Fun! 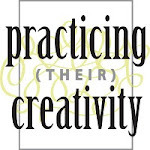 Thanks for joining us on the Simon Says Stamp Challenge blog!